This blog piece was written by Sarah Rudd, Sage Corps' summer marketing intern. Located in sunny SoCal, the University of Southern California is known for its rigorous academic programs, successful sports teams, and, of course, beautiful weather. However, the university is also known for some of its notable alumni entrepreneurs, including one of Myspace’s founders, the co-founders of Tinder, and the founder of Lucasfilm. Speaking of entrepreneurship, we are excited to have nine total USC students learning from some of the best entrepreneurs in Singapore, Berlin, Chicago, Amsterdam, Melbourne, New York, and Santiago this summer! We checked in with two of our Summer 2017 fellows from USC to see what they’re up to in Singapore, and here’s what they had to say. Bulat is interning at billionBricks in Singapore, an NGO startup that uses architectural and design knowledge to work toward solving homelessness. His responsibilities include monitoring social media channels and working toward improving exposure and awareness on the website and social media posts. Bulat is a rising senior studying economics and business. "Understanding how startups work, and the importance of communication between the co-workers." "Although I like living in the U.S., I thought that while I am young, ambitious and still have energy in the tanks, I need to explore the world and get myself outside my comfort zone to go to some exotic places around the globe, like Singapore!" "An event with one of the co-founders of Vision Strategy Storytelling (VSS) at a fancy co-working space near the Financial District. 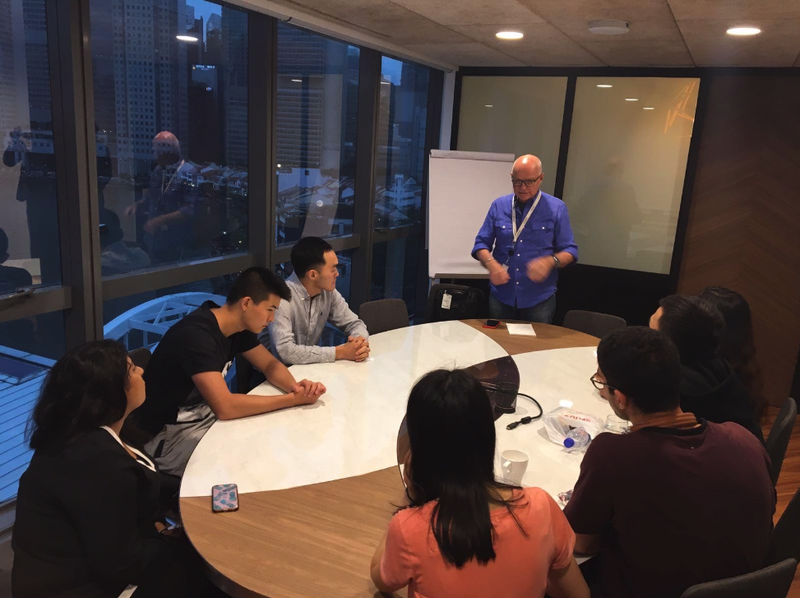 Here, we got to know about the implications of moving to Singapore for work, the highlights of managing an international company, and so on." When we asked Bulat if he had a favorite faculty member from his time so far at USC, he quickly got back to us with a name: Patrick Henry, Assistant Professor, Clinical Entrepreneurship and Director University Venturing Summit. "I'm not surprised that Bulat is enjoying and excelling as an intern in Singapore with Sage Corps. Bulat was a top student in my class at the Lloyd Greif Center and like so many of our international students - a true multinational entrepreneur who is confident and capable in any environment. I'm confident that the experience and skills he develops during his time with Sage Corps will benefit him throughout his career journey. Living abroad, interning, and experiencing cultures are such life-changing experiences for college students that I hope more students at USC can have similar immersion experiences." Bulat hopes to work in San Francisco post-graduation, though potentially could see himself eventually coming back to Singapore to work. Bulat, Haiwen, and their Singapore cohort at an event hosted by Vision Strategy Storytelling. Haiwen is a sophomore studying Business Administration. This summer, he is working as a marketing intern for Nickel.to, a Fintech company in Singapore that provides money transfer services via a proprietary FX platform using cryptocurrencies. Some of his responsibilities include content creation for the company website, market analysis, and general business development. "One of the biggest challenges that I’ve successfully overcome this summer was learning “Singlish,” a combination of Chinese, English, and Malay. I am fluent in Chinese and English but it took me a long time to understand. My peers also teach me Singlish terms during lunch and social hours." "I decided to participate in Sage Corps because of my interest in entrepreneurship. Working for a startup is a unique experience because I get to learn about how a business grows from an innovative idea to a product in the market." "The most valuable lesson I’ve learned in Singapore is to be open and accepting. Singapore is a very well-developed and well-integrated society where different cultures combine and produce a unique one. This summer experience makes me more determined about my goal to work in Singapore in the future." Haiwen is still figuring out what exactly he would like to do after graduation, but as of now he is hoping to work in Singapore in the technology industry. As this summer is drawing to a close, we can’t wait to see what Bulat, Haiwen, and the rest of their USC peers are able to accomplish in the remaining weeks of their fellowships. We know that they will continue to achieve great things when they return to the University of Southern California this fall as they continue to develop their careers. Who knows - we may even find their names among other USC alumni entrepreneurs one day!